Crawley Town captain Jimmy Smith felt that their dramatic 3-2 home win over Bury was fully deserved. Smith opened the scoring, before Filipe Morais saw a goal dubiously ruled out. 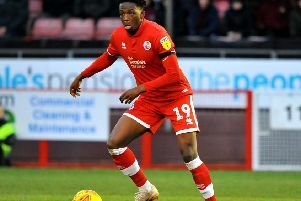 Crawley had another goal ruled out, correctly, through Dom Poleon and then Bury rallied through two second half goals from Chris Dagnall and Danny Mayor. Panutche Camara levelled late on before Ollie Palmer popped up with a late strike to secure the three points. Smith was pleased with his goal after recently returning from an injury and felt his hard work the summer had paid off. He said: "It was frustrating for myself being injured after picking it up over the summer. "It was hard for me going back to pre-season but I worked hard and feel that my goal today was deserved." Smith felt that the goals that the Reds had chalked off allowed Bury to rally and get back into the game, describing the Morais decision as 'bizarre'. He added: "Today we deserved our win and I feel we had two goals that were disallowed that shouldn't have been. "If we had gotten to 2-0 I don't think they would've pushed on but that gave them a bit of a boost and got them back into the game. "We had a free kick just before that and I made a run in behind and they cleared it and it went to our left back and it made it's way to Filipe and the goal went in and the referee waved it as offside. It was very bizarre." The Crawley Town skipper also praised the mentality of the squad to rally back from 2-1 down to win 3-2. Smith felt his side were fully deserving of their win and that his side we the better side on the day. He said: "We made it hard for ourselves even though I thought we should have been 2-0 up. "It showed great character from the lads to get back into it and we got a late goal again so it was good to get the three points. "Man for man everybody wanted to get the three points and it just shows our fitness as well just to keep going because we were hard every single day".